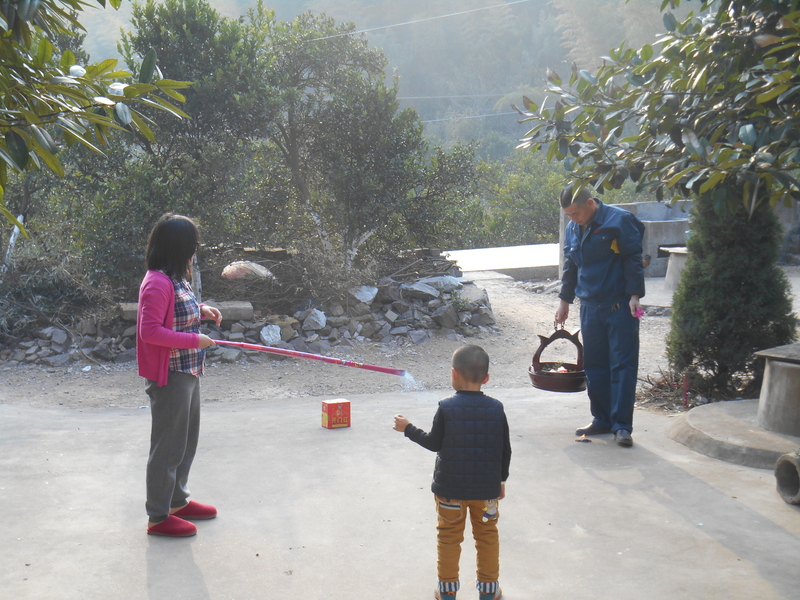 There are lots of traditions and superstitions surrounding Spring Festival in China and I learned about a couple of Spring’s family traditions. Firecrakers – the last meal of the old year her dad lit firecrakers (noise makers) before dinner… So did everyone else in town, so you could tell exactly when everyone was having dinner by listening for the fire crackers. (On a sidenote, I learned that you can just use bamboo instead by cutting it into sections with the two nubs still attached. The air will explode and bang loudly when you burn it). Admiring the gods – Spring’s family is Buddhist, and I say that in the loosest possible sense. 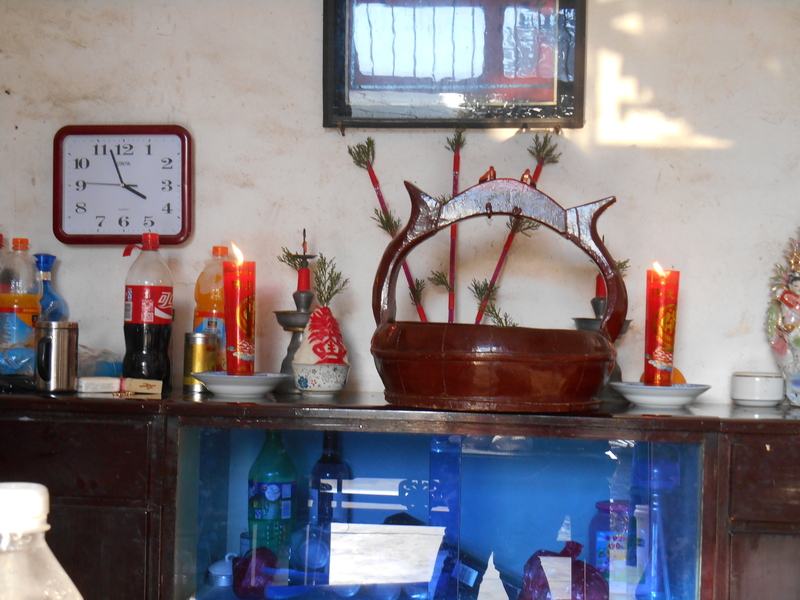 Once a year for spring festival they light incense and waive it in front of a small statue located on their dinning room side table. They lit candles and placed a basket with offerings of meat, fruit and rice in front of a memorial to their ancestors and a third incense was lit in the kitchen for the kitchen god who would provide abundant food for the family. Fire Works – different than fire crackers these are the pretty ones with lights. We lit these new years eve night before bed. The kids and I watched from the safety of an upstairs room while her dad lit off the lights. New Years Day Noodles – the first meal of the new year is cooked by the man. He makes noodles, they are long to celebrate a long life, and the man cooks to symbolize that he will help with the household chores throughout the year. Also before breakfast you light off more noisy firecrackers. No Sweeping – all these firecrackers and stuff make a mess in the yard but it is a tradition to not sweep on the first day of the new year. The more red bits of paper in your yard the better. Seasonal Goodies – everywhere we went our hosts set out nuts and seasonal fruits like apples and pears to snack on. I thought it was much healthier than the chocolates and cookies that Americans typically set out at Christmas time. New Years Calls – for the first fifteen days of the new year families will make new years calls on each other. You should always bring a gift for the house you are calling on to give the host when you arrive and they in turn give you a parting gift when you leave. Children traditionally receive a red envelope with money in it as a gift. I really enjoyed my time with Spring’s family and was overjoyed to find teachable moments in relating my Christian faith in contrast with the traditions of her family. For example I explained that as a Christian I believe that there is only one true God who created the world and everything in it, and we do not worship so many gods. I also explained that God is spirit and does not dwell in a tangible form like a statue or idol that we can see. I related some of her traditions to things that God commanded under the old testament laws and explained that God does not take pleasure in incense and offerings anymore but in the content and character of our hearts.